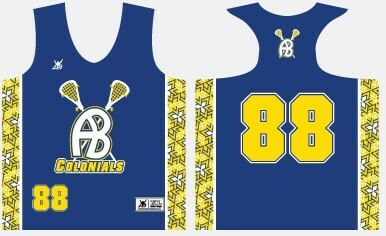 ABGYL Reversible Jersey and shorts are not part of the registration fee. In addition, most girls wear some type of athletic compression shorts underneath their uniform. With our season starting the first Sunday in April, players should be prepared for inclement & cold weather with appropriate gear. Women's Cold Weather Gear, such as long sleeve athletic shirts and leggings are beneficial in the early spring. Playing equipment is the responsibility of each individual player to purchase and are not provided by ABGYL as part of the registration fee. Below is a list of the various equipment required to play lacrosse for ABGYL. While Girls Lacrosse is a non-contact sport, it does require safety equipment to protect the health of the player. Stick: The essential part of the equipment package. Ranges from $40 - $150. Most of the lower priced sticks are designed for younger ages. As a girl's skill progresses, she will eventually require a more advanced lacrosse stick. Eye Mask: Cost roughly $50. They come in two sizes- youth and adult. Most older girls require an adult sized mask. Mouth Guard: Mouth guards come in various shapes and sizes. Mouth guards for our Lacrosse league must fit completely in the mouth. Mouth Guards cannot be clear, they must be visible to the referee. If you daughter has braces, ask your orthodontist for an appropriate mouth guard. Cleats/Turf Shoes: Players should play in cleats/turf shoes which can be worn on both grass and turf surfaces. Please Note: All girls participating in the ABGYL program must wear USL certified goggles and a mouth guard, during every practice and game, or they will not be allowed to participate. In addition, your daughter must remove all jewelry before each game and practice. There are no exceptions!